Morning dawned with a blond head resting on Cya’s shoulder, the face away from her. She’d lifted her hand to tousle the hair before she remembered that this particular blond was new. Gwyn, whose father had named him both fair and a suitably Arthurian name. She moved gently, deciding she was going to have to see if he could handle casual touch eventually. He woke at her fingers in his hair and made a small noise before he, too, came awake and went still. She found herself grinning. She’d always liked this first part, anyway. This entry was originally posted at http://aldersprig.dreamwidth.org/1045421.html. You can comment here or there. [Altersprig]: My first complete Ana White pattern! I’ve been admiring Ana White‘s blog/how-to site for a while now. She breaks carpentry-based DIY and knock-off decor down to a very accessible level, and, even though I grew up with basic carpentry, I didn’t grow up following carpentry PLANS, so I really do appreciate this. So when I looked at my pile of tiny and small art and looked at the wall in my girl cave, I thought a-ha! I bet Ana White has a plan for this! And she did! $10 Ledges. I went a bit smaller and cut the length into 3 equal pieces – 3″ boards instead of 4″, because it’s a very small room. The lumber cost me $15, the paint is the same as the rest of the room, and glue and screws were around the house. Dad actually helped me put them together and Mom helped me paint them when they were up this summer. And then, finally, a couple weekends ago, I put them on my walls and started playing with pictures. …at which point I found out that Zazzle postcards are not quite right for 4×6 frames, sigh. Not much shows in this picture, but the “L” is by kelkyag, the mermaids are by ellenmillion, the tiny picture is a drawing of Death that kissofjudas bought me, and the postcard is of Mackinac Bridge, from a family trip in my pre-teens. 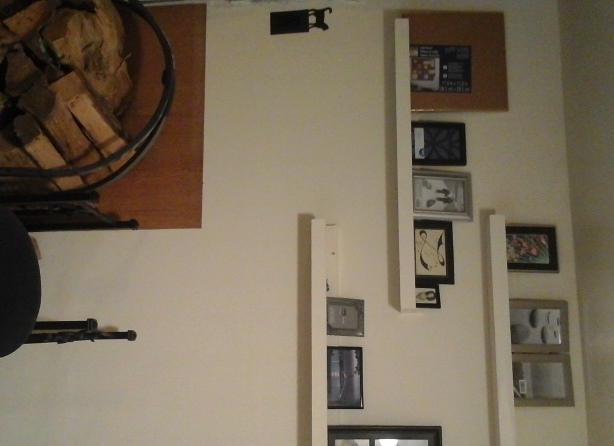 Next up: I bought two shelf brackets from Lee Valley to put a broader shelf on the other wall. Dictionaries and books I’m published in! This entry was originally posted at http://aldersprig.dreamwidth.org/1045082.html. You can comment here or there. Written to clare_dragonfly‘s prompt. Before Year 19 of the Addergoole School. Shira Pelletier was having a bit of trouble. “No, this is ridiculous.” The girl would not come out of her house, and had settled for talking to Shira through the tiniest crack in the door. “There is no way. I’m safe here. I’ve got food, water, the people don’t hate me… If you go away soon, that is. I don’t want to stick out. “We don’t talk about those things here. We don’t talk about anything like that. We’re all normal. Human. Here.” She punctuated that with kicking the door. Shira sighed. Those that would have survived. This entry was originally posted at http://aldersprig.dreamwidth.org/1044971.html. You can comment here or there.